Looking for a suitable commute app to help with your hectic routine? Or wondering what is the best app for traffic? We have compiled a list of best commuting apps and best apps for traffic that can be easily downloaded on your smartphone and help you everyday. Whether it’s by bus, train, or automobile, commuting can take up a significant portion of your day. Even on the best of days it can be a drag, not to mention the regular delays that commuters are subjected to. Fortunately, there’s a whole new generation of apps designed to keep you informed and entertained. Receive traffic conditions and disruption alerts, stay informed about potential service cancellations, and find ways to make your commute pass by more quickly with these handy apps. If you commute by bus, download the iNextBus real time bus tracker. This free app supports about 130 different cities and provinces throughout the USA and Canada, offering real time information about local bus routes and movement. If your usual bus is delayed, you can spend your time waiting in a cosy coffee shop rather than in the pouring rain, watching its movement as it approaches your stop. It’s also fun to watch the city’s buses as they move along the map, giving you an overview of traffic snarls and delays. Do you commute by car? Stay abreast of travel delays with crowdsourced travel app Waze. There are now over 30 million Waze users, who can join groups to share information and enjoy live traffic conditions alerts. If there are any delays on the way to work, you’ll be able to find the fastest alternate route to avoid saving precious time. Traffic conditions are getting worse everyday and very unpredictable. Many car commuters do not know what are the traffic conditions on their route and end up staying on the road for long time. Act smarter and use a traffic app to make best use of you time. Waze is certainly the best app for traffic. An all-purpose public transportation app for bus, taxi, subway, and trains, Hopstop is free to download and available for hundreds of cities worldwide. This app is particularly useful if you’re travelling on an unfamiliar route, finding the fastest way there with your preferred method of transportation. Yet even for the daily grind, it calculates the time you’ll take due to any changes in service or traffic alerts, helping you avoid missing an important meeting. This is best app to avoid traffic without really knowing much about details. UK commuters or travellers can plan their train journeys with the National Rail Enquiries app. It hosts a number of features, including alerts for cancellations or delays on your usual route, as well as the ability to save your top journeys. Another clever tool is an alarm that wakes you up if you doze off, ensuring that you don’t miss your stop at the end of a long work day. This free app is available for both iPhone and Android. Broadband access has now become standard on many trains thanks to the rollout of networks like Nokia Networks GSM-R across the globe. Take advantage of this high speed internet and play conductor with games like Train Conductor. This allows you to control mini trains with the swipe of a finger, creating new track connections and manage peak commuting times. It’s a fun way to make your journey fly right by. Avoid getting bored while sitting in traffic by downloading the Umano app for iOS or Android. This keeps you up to date on the latest news from the sources of your choice, using real people reading the stories to you rather than a computerized voice. Whether you prefer politics, opinion, or sports pieces, this app helps the minutes go by just a bit faster on your drive. This a free app that provides maps that show traffic conditions on a particular route at a given point of time. The data is collected through billions of data points using traffic sensors. Data is updated every minute. This allows you to easily choose the best route, saves time and fuel. It helps in planning the best possible routes and helps by-pass areas of slow traffic and congestion. It helps you locate your car in congested parking spaces like malls, movie theatres, street parking facilities or any other parking space. Uses a compass to guide you back to the exact location of your car. ones with the lowest prices. Users can download and install the application free of charge, and also get a chance to win rewards and prices. Car Minder is an easy way to keep track of your cars maintenance needs like tire rotations, oil changes, records of previous maintenance work done on your car, mileage and fuel economy. It’s a simple way of keeping track of maintenance needs of multiple cars at the same time, from a single convenient platform. app, it has the potential to save lives and help you get home safely. Gives you real time information about any traffic route. The app updates frequently and is so reliable that even TV and Radio stations use the technology to power their traffic reports. Get accurate data about traffic situation, average speeds, incidents and road work on any route. Plan your routes or choose alternative routes, save on time and fuel. know all of this even when you have no internet access. Daily Commute is a smart app that analyses data from previous commutes and helps you plan better. Based upon previous data, it allows you to choose a target destination and provides a “target leave time” once you punch in “target arrival time”. The integrated technology helps the app provide more reliable and accurate information. Useful for people who use public transportation like trains, buses, ferries etc. It helps in choosing the least crowded routes using GPS technology. Crowdsourced data helps the app to recommend the best routes and provide estimated travel time. Automatic comes as a dongle that connects to the OBD (On Board Diagnostics Port) of your car, which in turn communicates with an iPhone app and starts beeping whenever it detects bad driving behaviour. It can help you at least a third of all you spend on gas each year. Commute: Traffic, Road Conditions & Drive Time By AOL Inc. Monitors the road conditions along your daily route and alerts you about traffic conditions. It also alerts you about any incidents and let you know about what to expect while travelling to work or coming back. It’s a simple app that notifies you about travel and traffic conditions 15 minutes prior to the commencement of your daily commute. You can open the app to get details about any other route as well. Starts automatically when you are moving at speeds greater than 5 miles per hour and provides comprehensive details and IRS compliant tracking reports. Provides directions and navigation and calculates estimated travel time to your favourite haunts, or any destination. It works equally well even if you’re just walking to a place. Saves information about calories burned, route, speed, elevation and much more when you walk to a place. It also permits integration of the information with Apples’s health app or share the details on social media. Provides alternate commuting options in any location, especially if you were taking a walk and suddenly felt the need to get a bus cab, or public transport. A must have for Londoners using the underground railways. Let’s you know exactly which carriage to board, and all you need to know for effortless travel. Calculate your carbon footprint, enhance your awareness about the planet's eco-system and do your bit towards a healthier planet. Turn by turn navigation for those who enjoy walking. It includes user-submitted leisure walks for more than 60 towns in Scotland and London. UDOT Traffic allows travelers in Utah to get access over the detailed road map of Utah. It's provided by Intelligent Transportation System and you can get travel-wise alerts as well as present road weather conditions. 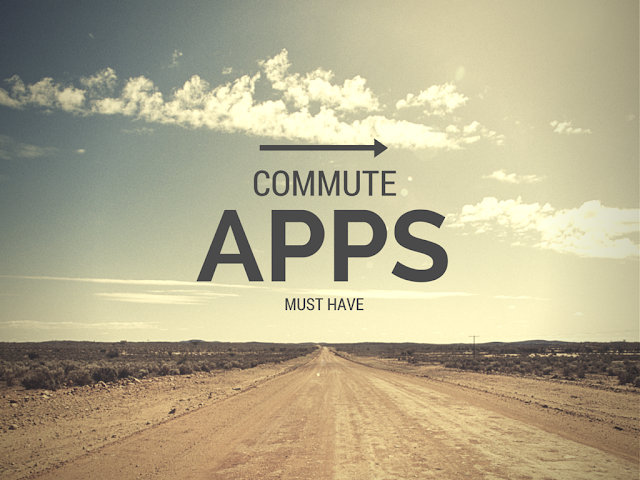 Download these apps to make your commute more efficient and entertaining. You’ll be able to avoid wasting time in unnecessary delays and have a few extra minutes of peace as a result.